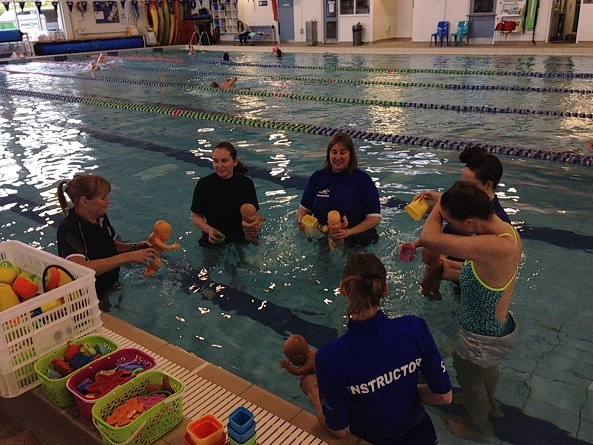 The Early Swim Teacher Award (ECSTA) course is for swim teachers who want to teach under 5s and understand the development of the child in the water and how to assist that development. 11 swim teachers from swim schools in Wellington including Wellington City Council, Kapiti Learn to Swim, H2O Xtream and Swim City Swim Schools came together to learn, share ideas and philosophies and the challenges that they face. The course involved a theory session with a pool session where the participants happily shared the songs, games and activities they regularly use in their under 5s lessons. The participants enjoyed learning about the baby reflexes and how these affect child development in the areas of physical and mental development. The one day course was developed in consultation with Gill Connell who is recognised world-wide as a leading educational consultant in child development, movement, word study and Perceptual Motor Development (PMP). The ECSTA is designed to assist swim teachers to understand why we do what we do in the pool and to pass on that knowledge to parents. Participants receive a comprehensive manual linking childhood development to the water and the Ready for School DVD produced and directed by Robyn Cox. The participants came to the course with a wide range of experiences with some being very new to teaching under 5s, whilst others having many years of experience. It was lovely to see those more experienced supporting the less experienced along the way, happily sharing their knowledge and ideas.